The RGM Hollywood watch was made for Hollywood 1923 in a limited edition of 12 pieces. It isn’t every day that you can say you are wearing an actual piece of Hollywood on your wrist. However, thanks to American watch brand RGM, and a group of cinema buffs known as Hollywood 1923, you now have a one in 12 chance of doing exactly that. Roland Murphy, founder of RGM, was approached by Hollywood 1923, who had purchased the very last metal from the original 1923 Hollywood sign after the restoration of the sign earlier this year. They wanted RGM to make the metal in to watch dials. Unfortunately, it was not of the caliber to be used for a dial, but Murphy had another idea. He suggested a metal Hollywood plaque on the dial — made in the likeness of the original Hollywood sign that was erected in 1923, and using the metal. Voila…Hollywood on the wrist. 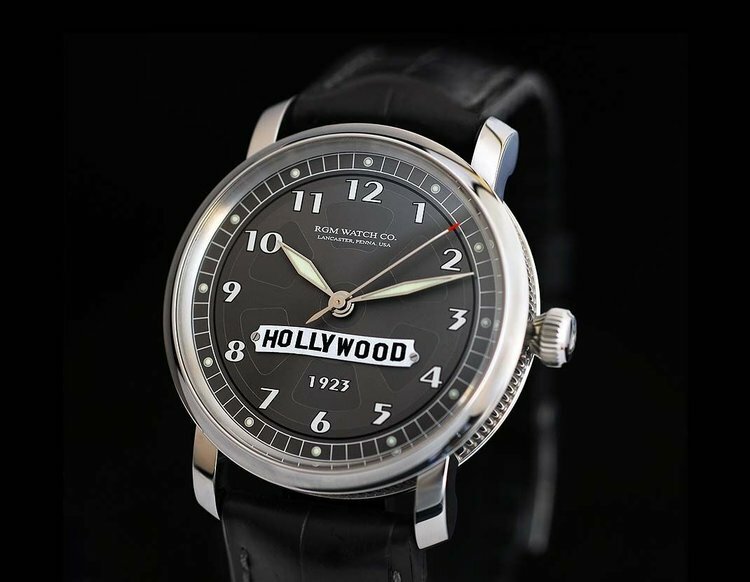 The Hollywood Watch by RGM for Hollywood 1923 features a piece of metal from the original Hollywood sign that was erected on the hillside in 1923. Of course, RGM is known for its custom work, and so the Hollywood theme didn’t stop there. The brand embellished the “shades of gray” dial with a filmstrip motif, and added Art Deco numerals for the great Silver Screen appeal. 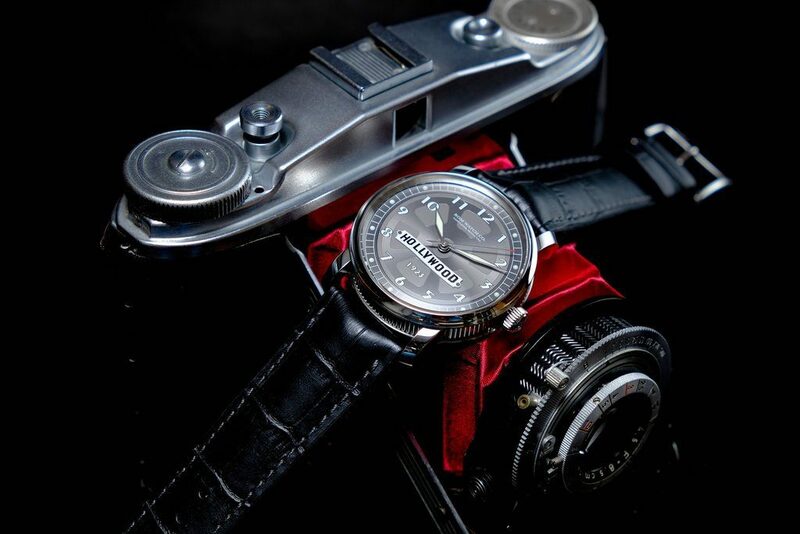 The stainless steel case is RGM’s USA-made Model 25 that is 40mm in diameter. It is equipped with an automatic ETA 2892-A2 movement. The Hollywood name is printed on the metal plaques at the RGM workshops. As mentioned, RGM made these watches — in a limited edition of just 12 pieces — for Hollywood 1923. They are available for sale only through Hollywood 1923, which states that just the numbers 3, 4, 5, 10 and 11 are available for sale, at a retail price of $9,500. This may just be your claim to fame. 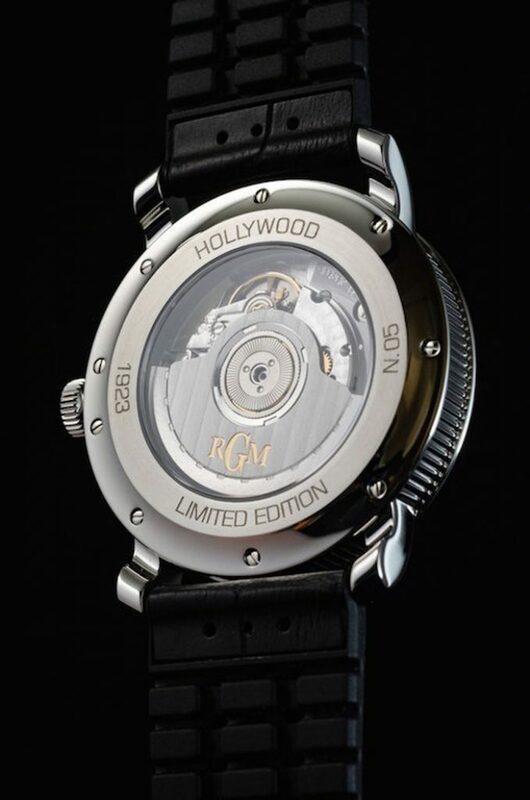 Each Hollywood watch by RGM is numbered.